A lot has been said in the last few years about non-veg foods by doctors, nutritionists, health freaks, environment activists, animal-welfare organisations and meat companies. Whether these statements have been positive or negative, the world population has neither gone totally vegetarian nor has every person taken to meat eating. While the conversion from one food habit to another continues, let us take a look at some of the differences between non-vegetarian foods on the one hand and vegetarian foods on the other. In the West, foods are broadly classified into animal foods and plant foods. Animal foods include all foods that come from non-plant sources like meat, fish, egg and dairy products. 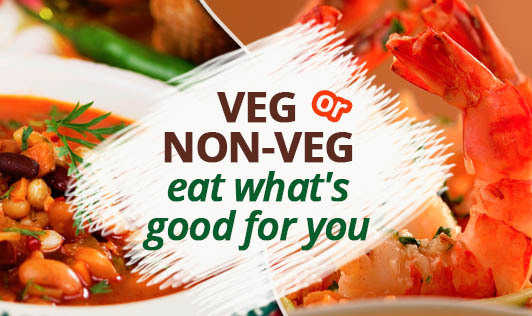 However, in India, we talk of non-vegetarian foods and vegetarian foods. While some believe that vegetarians are those who take only plant foods and dairy products, some others include eggs in the vegetarian list and a few think of fish as a vegetarian food. Vegetarians are of three types -vegans (eat only plant foods), lacto-vegetarians (plant foods + dairy products) and lacto-ovo vegetarians (plant foods + dairy + egg). For convenience sake, in this article, I shall refer to plant and dairy foods as vegetarian and all others as non-vegetarian foods. In our country, people are by and large lacto-vegetarians (plant foods + dairy products) though there are some who cannot complete a meal without a non veg dish. Rhoda Mohan, an executive in a placement firm, says that one dish is definitely non-veg in her mother's house on any given day. Dais are used occasionally because they believe that dals cause gas trouble. Non-veg foods are not without nutrients. After all, animals and birds have to survive on nourishment. Chicken, fish and egg are often prescribed to patients for different ailments. All non-veg foods are high in protein content. Many of them are high in saturated fats. Some varieties of fish are very good sources of calcium and phosphorus. Liver contains a high amount of iron and also stores vitamin A. It's probably because of these high values, some believe that a) non-veg eaters are healthier than vegetarians; b) non-veg is essential to build muscle, specially for sports; c) non-veg foods should be taken by children for better growth and development and d) a non-veg diet is more nutritious than a veg diet. If this were true, why is it that many people who can afford to buy non-veg foods, still continue to be vegetarians? Why is it that children and adults in vegetarian families continue to be as healthy, if not more, as those in non- vegetarian ones? Why are non-veg foods frowned upon by different groups of people? One common answer to the above questions is that a vegetarian diet can give all the nourishment required for a human body. The proteins, vitamins and minerals found in non-veg foods are found in vegetarian foods also. The sources of these nutrients are whole grains, pulses, vegetables and fruits. In recent years, the greatness of fibre has been discussed all over the world. Fibre has a role to play in a) preventing constipation, obesity, colon cancer, and b) controlling diabetes, hypertension and cholesterol levels. Unfortunately, animal foods do not contain fibre. This is probably one of the reasons that the National Institute of Nutrition does not recommend more than 30 gm of meat and fish for a normal adult per day. Besides religion and family tradition, a growing awareness about the harmful effects of excess intake of non-veg foods seems to be another reason why some people believe in vegetarianism. Gopinath Aggarwal in his book titled Vegetarian or Non vegetarian: Choose yourself, gives several reasons why a human being should not eat non-veg foods. Longer intestines, alkaline saliva and blood, lesser secretion of hydrochloric acid in herbivores when compared to carnivores, are some of them. Plant foods do not contain cholesterol and therefore are becoming popular among the health conscious. After marrying into a Hindu family, Rhoda Mohan gave up eating beef and as awareness increased in the last few years about the ill-effects of high cholesterol, she has reduced her intake of non-veg to once a week. The recent concern about mad cow disease in Britain is converting about 28,000 Britons to vegetarianism every week. In the West, a vegetarian is now viewed as being smart, healthy, caring and responsible. Some others are believers of vegetarian foods due to humane and ethical reasons. Asha Subramaniam, member of People for Animals, says that non-veg foods should not be eaten by human beings for two important reasons. Firstly to avoid killing and selling animals for a commercial purpose which amounts to cruelty. Secondly, the structure and function of the human digestive system is meant for plant foods and not animal foods. Does this mean that vegetarians are guarded against heart disease and other food-related problems of the modern world? Only to some extent. An excessive intake of high-fat dairy foods, fats and oils, salt and highly refined foods can lead to obesity, heart disease and other problems even in vegetarians. No one is immune to diseases caused by an imbalance in food intake. Whether vegetarian or non-vegetarian, foods should be taken in the right quantities which is best suited to the human body. Otherwise, foods can kill! Let the food that you eat build and maintain your health, not destroy it.